…How to properly make sacrifices to the G-d of Israel, animal sacrifices, which should not surprise. We see animal sacrifice in the foundational story of our people, the binding of Isaac, which ends with the command to sacrifice not a human being but animal, a ram. The psychoanalysts would call this sublimation. The story of the binding of Yitzhak has many features, one of them the moral of a God that opposes human sacrifice, and redirects the impulse to the killing of animals, which Judaism further refines by the laws of proper and improper ways of killing animals for our food. We know that after the Flood eating meet was allowed, though perhaps the Almighty wished we had transcended our natures as carnivores. In this regard we not different than lions and tigers and grizzly who feed on the meat of the animals they kill. And what was the Temple, both Temples if not a holy abattoir, slaughter house. The Temple’s central function was killing animals properly as a sacrifice, which was a gesture to God, but why that? Well, what else are you going to sacrifice if not the animals on which we depend for food, clothing shelter? …Interesting name, Canaan, whose first three letters in Hebrew form the verbal root kaf nun ayin, commonly used in the Nifal and Hifil conjugations. Lehekana is to surrender, give up, go down on one’s knees in submission. In the Hifil, lehakhnia is to defeat someone, make him go down on his knees. In other words, the 1991 repeal of the 1975 UN General Assembly “Zionism is a form of racism” had no affect on this man. Zionism remains for him a form of racism, meaning the Jews are a race and discriminate against all others on the planet who are not of this race. 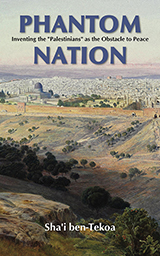 …If my book has a thesis, it is that today’s Palestinian Nationalism is just this generation’s version of hating Jews and works to shield Islam in particular from my contention that it is a form of antisemitism. 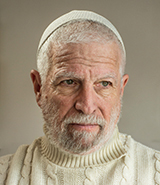 …Now, the most common way to be post-Jewish is discarding the religion, and in the Jewish religion as in no other religion, that means discarding more than belief. It means behaviors, activities that one engages in many times every day. 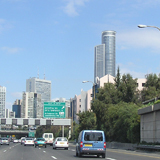 And that is one feature of the state that post-Jewish Israelis built. Israelis are also not Jewish in the understanding of non-Jews, not when the purpose of their non-religious Zionism was to erase the line between Jews and the goyim, significantly a word not in use in this Jewish community, surely the first in its history. In my visits to Arab countries and the remnant of Jewish communities in them, I learned that the Israeli practice of calling the Arabs “Arabs” was not practiced in Tunisia, Yemen, Iraq. For these Jewish communities the non-Jews around them were the same as found in Europe. They didn’t call them Arabs but goyim, just like my Polish grandmother of blessed memory. In Yemen, their accent calls them joyim. I also remember asking a little Yemenite Jewish girl in Arabic, pointing at a cow, who is her name? And she answered a behema, just like my Polish grandmother. The Return of the Destructive Left? …And I think a major cause and symptom is the absence of representative government via elections by geography. For example, as a resident of Manhattan for most of my life, I had different representatives for different sections of government, city, state, national – but not in Israel. I had as a Manhattanite a congressman in the House of Representatives, who had an office in my district that I could call, or his Washington office, to ask for help or voice an opinion, and knew I would be responded pleasantly because the congressman wanted my vote and has to renew my mandate to him every 24 months. In Israel, by contrast, I have no representative in the Knesset who wants my vote. Political parties in Israel are clubs, and when one joins, he of course must support the party leaders. Different ideas are not encouraged. This structure leads to behavior absent from better democracies. …So I am not overly concerned over the top concern in Israel’s MSM today. which was the current peregrination of Jared Kushner and Jason Greenblatt and a State Department chaperon to various Arab states talking up their answer to the Oslo Abomination that failed big time. Naftali Bennett is warning that Netanyahu will be putty in their hands and go along with them, as he said, creating a Palestinian state bordering Route 6, a major highway. …How many wars have been fought over who owns Jerusalem? How many countries have ruled here? Let’s see besides the Jews, the Assyrians, Babylonians, Persians, Greeks, Romans, Byzantine Christians, Arabs, Ayyubid Kurds, Mongols and Mamelukes, who were former slaves who rebelled, Ottoman Turks, the English. And ever since the contemporary State of Israel came into being in 1948, the United Nations has been the scene of chronic Israel-bashing by the nations of the world assembled. And they do that, of course, because they believe they have the moral right to tell us, we have no right to our because we stole it from the Ancient Ones and must return at least some of it so they can have the independent state they have been dreaming of for thousands of years during which they perpetually denied the independent state they dreamed of. As the Jews had to be compensated for the Holocaust and were by being given a state, so the Ancient Ones must have one too. …This morning yours truly woke as usual to the first news from the old Kol Yisrael station that the Lapid party Gantz party decided to unite to defeat Prime Minister Netanyahu whom they loath because of their ugly envy of him. One of Bibi’s great strengths is his verbal defense of the country in perfect American English, especially in use with every foreign diplomat. I doubt Benny Gantz can hold a candle to him in this regard. …If I accomplish nothing in my deprogramming career but the following, I will die happy. The other day, another webcast, I explained how three things make in a believing Jew, and one of them being antisemitism. And if I accomplish nothing but teaching Jews to marvel at it and take pride in it as much as they rightly fear it, I will be a happy man. Defending Ilhan Omar. For Real. …Two days ago another Jew, another Jewess, was butchered. literally, stabbed many times to death by a Muslim who, the MSM here in Herzlandia call a “Palestinian.” Ori Ansbacher, 19, was pounced upon a 29-year-old descendent of Ham, Ishmael and Muhammad who gloried in his own hundreds of murders of Jews by chopping off their heads. …Today the MSM published the results of the Likud primary, meaning, a numbered list of candidates according to the number of their supporters. We know the position of every one on the list, and I ask you, what good is it for me to know the results of this vote? What is the significance for the people of Israel to know that Gideon Saar is now No. 5, he who is perceived as a rival for power to Netanyahu? What does it matter that Miri Regev is No. 6 and Nir Barkat No. 9?